I just got a preview of Dior's amazing Summer '09 and it is knocking me out! 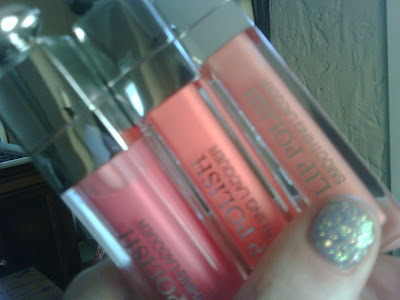 I'm totally in love with the Dior Addict Lip Polishes! Sorry for the lame camera phone shots, but these don't hit the counters til May so I can't find an official picture. But... how gorgeous are those colours??? What you can't see here is the really cool patented spinning applicator! It feels so great when you're applying it to your lips, like a little massage! The texture is super super glossy, and the colours are sheer. I'm so in love!!! 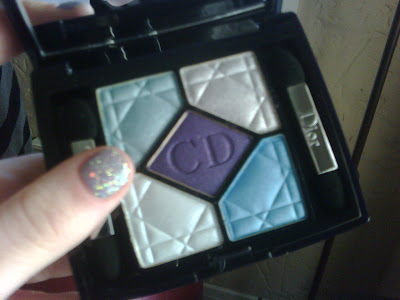 I also got to check out the new Dior 5-Colour Eyeshadow in Electric Lights from the Dior Cristal summer collection! The colours are très très iridescent! I'm totally feeling the silver and blue! These new products will be available in May, so keep your eyes peeled! These are MUST HAVES for any beauty buff! coolio. i love your nail polish. It's kind of hard to see in the photos, but it's actually not polish, it's gel with glitter and other fun sparkly things! oooh sounds cool. i love a good glitter polish but HATE how hard they are to take off.